ACTION ALERT ~ Urge the Trump Administration to Keep Wolves Protected! The U.S. Fish and Wildlife Service has issued a proposed rule to strip Endangered Species Act (ESA) protections for gray wolves in the lower 48 states – a premature decision unsupported by science that will further threaten an already imperiled species. Federal protections for gray wolves brought the species back from the brink of extinction following decades of persecution. This rash decision to delist wolves from the list of endangered and threatened wildlife would allow states to open killing seasons on wolves, permitting special interest trophy hunters and trappers to senselessly kill wolves before the species has made a full recovery. As demonstrated in Idaho where wolves have already been stripped of federal ESA protections, once delisting occurs the species is open to a variety of killing activities – including predator derbies, contests and tournaments where those who kill the most or largest wolves are awarded prizes. This is after the federal government spent millions of taxpayer dollars reintroducing wolves into Yellowstone National Park after their populations were decimated from unlimited killing! We need your help to keep federal protections in place for wolves so these iconic and vital animals are able to recover and return to their historic range. Please submit comments TODAY in opposition to the proposed rule to delist wolves. The U.S. Fish and Wildlife Service is accepting comments on their proposed ruleto remove wolves from the list of endangered and threatened wildlife. Click here to submit your comments electronically. If your comments fit into the comment box, this method is preferred. For longer comments, please attach them in a Microsoft Word document. ● Continuing Endangered Species Act protections for wolves is necessary for the species to fully recover. Federal protections saved gray wolves from extinction following decades of persecution – and the species is still recovering, currently occupying only a fraction of their historic range. ● The proposed rule would transfer authority over wolves to state wildlife management agencies, which historically have shown little interest in preserving or restoring wolves. These state agencies have catered to special interest groups who seek to kill wolves for trophies or entertainment, or on the misguided belief that killing wolves protects livestock or increases deer and elk populations. ● Wolves are vital to healthy ecosystems. Benefits wolves provide include increasing biodiversity by keeping large herbivores such as deer from overgrazing habitats and maintaining the health of prey animals such as deer by culling the sick members from the heard, including animals suffering from Chronic Wasting Disease. ● The best available, peer-reviewed science demonstrates that killing wolves will not protect livestock or increase populations of game species like deer or elk. Wildlife management decisions should be based on ethics and sound science, not fear and misunderstandings. ● The vast majority of Americans are wildlife watchers who prefer to view wolves in their natural habitat – preserved and treated with respect. Allowing wolves to return to their historic range and thrive will provide far more benefits to our economy than allowing a tiny minority of the population to extirpate these iconic animals from our landscape. Learn more about wolves here. Thank you for acting TODAY to protect wolves from extinction! According to a spokesman for the Idaho Department of Fish and Game, in August, the department provided a grant of $23,065 to the Foundation for Wildlife Management to reimburse expenses of hunters and trappers who kill wolves in 18 big-game management units where elk populations are low or where there are wolf-livestock conflicts. Fifteen of those units are in northern Idaho and three are in the McCall/Council area of western Idaho. The Idaho Department of Fish and Game is planning to expand the wolf trapping season and to open private lands to trapping. On Jan. 27, a poster appeared on Facebook offering expense reimbursement of up to $1,000 from the Foundation for Wildlife Management. The payments are funded by a grant from Fish and Game’s Community Challenge Grant and the Rocky Mountain Elk Foundation and are supported by the Fish and Game Commission, the Idaho Cattlemen’s Association and Idaho Farm Bureau. Wolves were reintroduced in 1995 because a whole lot of people cared about wolves taking their proper ecological role in ecosystem health. The Legislature and the commission have made it clear that wolves, and other predators, are not welcome in Idaho. Fish and Game wildlife biologists and conservationists understand that predators are the most important piece of the ecosystem puzzle. Instead, the commission has teamed up with the Foundation for Wildlife Management to manage wolves with increased trapping. The commission is setting policy according to the wishes of the legislators, trappers, the Rocky Mountain Elk Foundation, the Cattlemen’s Association, the Farm Bureau and their partner, Wildlife Services. There is no consideration of conservation whatsoever when it comes to predators. Wildlife are so vulnerable in the winter. A baited trap, a snow machine or an ATV have nothing to do with sportsman-like hunting and are inhumane and unethical. The Wood River Wolf Project, a group of conservationists, has worked for years with ranchers to implement non-lethal methods for keeping livestock safe. The commission is ignoring its mandate to set policy based on good science. The Department of Fish and Game has stated that since people like me don’t pay their salaries, I should not have a say about how wildlife is managed. But there are many Idahoans who care deeply for conserving wildlife and are willing to pay for conservation of wildlife. Please let the department and the commission hear from you. The Idaho Department of Fish and Game is proposing to lengthen the wolf trapping season in areas of the Magic Valley Region where it is already allowed on public land and to initiate a trapping season on private land where no season currently exists, including in Units 48 and 49, which surround the Wood River Valley. The pelt quality of furbearers is highest during winter. The quality of pelts from wolves harvested in October is likely to be poor. This feels like relaxing the constraints on legal harvest for the sole purpose of killing more wolves. Extending the wolf trapping season to the end of March is alarming. Mating typically occurs between January and March. Gestation is 63 days. Trapping and killing an alpha breeding female in the last trimester of gestation or early lactation is barbaric. If she dies pregnant, whatever she is carrying dies with her; if she dies lactating, her pups will starve to death in short order. The legal wolf hunting season for 25 units across several regions begins on July 1 and ends on June 30. Is this the direction we’re headed for wolf trapping? Restricting wolf trapping to private land will not eliminate the threat of injury to people, pets or livestock. There are thousands of acres of private land in wolf country in Blaine County that the public may and does legally access. Recreation in Blaine County is highly centered around outdoor recreation, including hiking with dogs. I fear that the private-land-only aspect of the proposed wolf-trapping rule changes has the potential for insidious incremental dismantlement. Are we beginning on a path that is simply a redux of the “private land first, public land to follow” scenario observed in other Fish and Game regions? What assurances do Blaine County residents have that this “evolution” will not occur here? Wolf traps are effective because of the bait used as an attractant. Wolves will likely be attracted from remote locations that include public land. The Sawtooth National Recreation Area abuts private land in the Wood River Valley and a portion of the Hemingway-Boulders Wilderness is in our backyard. Domesticated dogs will also likely be drawn to wolf traps on private land. The Wood River Wolf Project, a collaborative consisting of sheep ranchers, federal and state agencies (including Fish and Game), wildlife advocates, wolf experts and Blaine County, employs nonlethal tools to prevent depredation by wolves on sheep and, as a consequence, to reduce or eliminate lethal control requests by operators who have incurred wolf depredation losses. Killing more wolves in Blaine County is not an outcome favored by most Blaine County residents. The elk population in the game management units pertinent to Blaine County materially exceeds the high end of the target range. As a consequence, and to mitigate crop depredation losses and the associated costs to recompense farmers and ranchers, Fish and Game is pursuing significantly increased elk harvest in our area for the next several years while concurrently proposing to kill more wolves here. Why kill a native predator that kills elk if you want fewer elk? What about this makes any sense whatsoever? There are fewer than 2,000 trappers active in Idaho. Only a fraction of those trap wolves. Many of those who do are compensated by outside parties in amounts greatly in excess of the value of the pelts. Fish and Game is one of those funding entities. Though these payments are characterized as “reimbursement” for expenses incurred, your state game management agency is paying bounties to trappers to kill wolves. The proposed wolf trapping rules changes are confusing as to intent, are in conflict with the department’s elk management objectives, can only be viewed as the first step of several to further liberalize wolf trapping in Blaine County, raise ethical concerns in terms of the proposed season end date, benefit few, endanger many and, finally, are not wanted by most Blaine County citizens. How Accurate Is Alpha’s Theory of Dog Domestication? Long ago, before your four-legged best friend learned to fetch tennis balls or watch football from the couch, his ancestors were purely wild animals in competition—sometimes violent—with our own. So how did this relationship change? How did dogs go from being our bitter rivals to our snuggly, fluffy pooch pals? The new drama Alpha answers that question with a Hollywood “tail” of the very first human/dog partnership. Europe is a cold and dangerous place 20,000 years ago when the film’s hero, a young hunter named Keda, is injured and left for dead. Fighting to survive, he forgoes killing an injured wolf and instead befriends the animal, forging an unlikely partnership that—according to the film—launches our long and intimate bond with dogs. Just how many nuggets of fact might be sprinkled throughout this prehistoric fiction? We’ll never know the gritty details of how humans and dogs first began to come together. But beyond the theater the true story is slowly taking shape, as scientists explore the real origins of our oldest domestic relationship and learn how both species have changed along canines’ evolutionary journey from wolves to dogs. When and where were dogs domesticated? Pugs and poodles may not look the part, but if you trace their lineages far enough back in time all dogs are descended from wolves. Gray wolves and dogs diverged from an extinct wolf species some 15,000 to 40,000 years ago. There’s general scientific agreement on that point, and also with evolutionary anthropologist Brian Hare’s characterization of what happened next. ’The domestication of dogs was one of the most extraordinary events in human history,” Hare says. But controversies abound concerning where a long-feared animal first became our closest domestic partner. Genetic studies have pinpointed everywhere from southern China to Mongolia to Europe. Scientists cannot agree on the timing, either. Last summer, research reported in Nature Communications pushed likely dates for domestication further back into the past, suggesting that dogs were domesticated just once at least 20,000 but likely closer to 40,000 years ago. Evolutionary ecologist Krishna R. Veeramah, of Stony Brook University, and colleagues sampled DNA from two Neolithic German dog fossils, 7,000 and 4,700 years old respectively. Tracing genetic mutation rates in these genomes yielded the new date estimates. End of story? Not even close. In fact, at least one study has suggested that dogs could have been domesticated more than once. Researchers analyzed mitochondrial DNA sequences from remains of 59 European dogs (aged 3,000 to 14,000 years), and the full genome of a 4,800-year-old dog that was buried beneath the prehistoric mound monument at Newgrange, Ireland. 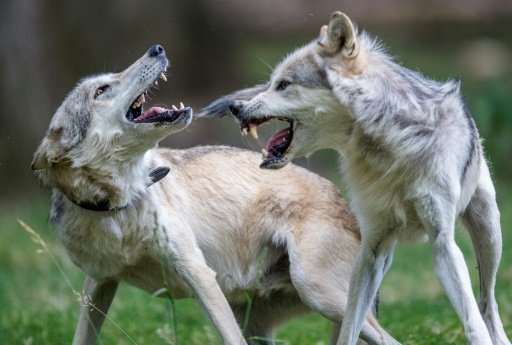 But because dog fossils apparently older than these dates have been found in Europe, the authors theorize that wolves may have been domesticated twice, though the European branch didn’t survive to contribute much to today’s dogs. Greger Larson, director of the Wellcome Trust Palaeogenomics & Bio-Archaeology Research Network at Oxford University, suggests that the presence of older fossils in both Europe and Asia, and the lack of dogs older than 8,000 years in between those regions, supports such a scenario. “Our ancient DNA evidence, combined with the archaeological record of early dogs, suggests that we need to reconsider the number of times dogs were domesticated independently. Maybe the reason there hasn’t yet been a consensus about where dogs were domesticated is because everyone has been a little bit right,′ Larson said in a statement accompanying the study. The many interbreedings of dogs and wolves also muddy the genetic waters, of course. Such events happen to the present day—even when the dogs in question are supposed to be stopping the wolves from eating livestock. How did dogs become man’s best friend? Perhaps more intriguing then exactly when or where dogs became domesticated is the question of how. Was it really the result of a solitary hunter befriending an injured wolf? That theory hasn’t enjoyed much scientific support. One similar theory argues that early humans somehow captured wolf pups, kept them as pets, and gradually domesticated them. This could have happened around the same time as the rise of agriculture, about 10,000 years ago. The oldest fossils generally agreed to be domestic dogs date to about 14,000 years, but several disputed fossils more than twice that age may also be dogs or at least their no longer entirely wolf ancestors. Since more recent genetic studies suggest that the date of domestication occurred far earlier, a different theory has gained the support of many scientists. “Survival of the friendliest” suggests that wolves largely domesticated themselves among hunter-gatherer people. “That the first domesticated animal was a large carnivore, who would have been a competitor for food—anyone who has spent time with wild wolves would see how unlikely it was that we somehow tamed them in a way that led to domestication,” says Brian Hare, director of the Duke University Canine Cognition Center. But, Hare notes, the physical changes that appeared in dogs over time, including splotchy coats, curly tails, and floppy ears, follow a pattern of a process known as self-domestication. It’s what happens when the friendliest animals of a species somehow gain an advantage. Friendliness somehow drives these physical changes, which can begin to appear as visible byproducts of this selection in only a few generations. “Evidence for this comes from another process of domestication, one involving the famous case of domesticated foxes in Russia. This experiment bred foxes who were comfortable getting close to humans, but researchers learned that these comfortable foxes were also good at picking up on human social cues,” explains Laurie Santos, director of the Canine Cognition Center at Yale University. The selection of social foxes also had the unintended consequence of making them look increasingly adorable—like dogs. Hare adds that most wolves would have been fearful and aggressive towards humans—because that’s the way most wolves behave. But some would have been friendlier, which may have given them access to human hunter-gatherer foodstuffs..
A study last year provided some possible genetic support for this theory. Evolutionary biologist Bridgette von Holdt, of Princeton University, and colleagues suggest that hypersocial behavior may have linked our two species and zero in on a few genes that may drive that behavior. “Generally speaking, dogs display a higher level of motivation than wolves to seek out prolonged interactions with humans. This is the behavior I’m interested in,” she says. Von Holdt’s research shows that the social dogs she tested have disruption to a genomic region that remains intact in more aloof wolves. 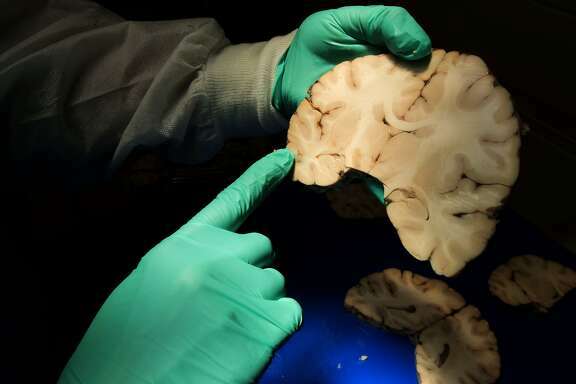 Interestingly, in humans genetic variation in the same stretch of DNA causes Williams-Beuren syndrome, a condition characterized by exceptionally trusting and friendly behaviors. Mice also become more social if changes occur to these genes, previous studies have discovered. The results suggest that random variations to these genes, with others yet unknown, may have played a role in causing some dogs to first cozy up with humans. “We were able to identify one of the many molecular features that likely shape behavior,” she adds. How have dogs changed since becoming our best friends? Though the origins of the dog/human partnership remain unknown, it’s becoming increasingly clear that each species has changed during our long years together. The physical differences between a basset hound and wolf are obvious, but dogs have also changed in ways that are more than skin (or fur) deep. One recent study shows how by bonding with us and learning to work together with humans, dogs may have actually become worse at working together as a species. Their pack lifestyle and mentality appear to be reduced and is far less prevalent even in wild dogs than it is in wolves. But, Yale’s Laurie Santos says, dogs may have compensated in other interesting ways. They’ve learned to use humans to solve problems. The relationship has become so close that even our brains are in sync. Witness a study showing that dogs hijack the human brain’s maternal bonding system. When humans and dogs gaze lovingly into one another’s eyes, each of their brains secretes oxytocin, a hormone linked to maternal bonding and trust. Other mammal relationships, including those between mom and child, or between mates, feature oxytocin,bonding, but the human/dog example is the only case in which it has been observed at work between two different species. The intimacy of this relationship means that, by studying dogs, we may also learn much about human cognition. “Overall. the story of dog cognitive evolution seems to be one about cognitive capacities shaped for a close cooperative relationship with humans, Santos says. “Because dogs were shaped to pick up on human cues, our lab uses dogs as a comparison group to test what’s unique about human social learning.” For example, a recent Yale study found that while dogs and children react to the same social cues, dogs were actually better at determining which actions were strictly necessary to solve a problem, like retrieving food from a container, and ignoring extraneous “bad advice.” Human kids tended to mimic all of their elders’ actions, suggesting that their learning had a different goal than their canine companions’. We may never know the exact story of how the first dogs and humans joined forces, but dogs have undoubtedly helped us in countless ways over the years. Still, only now may we be realizing that by studying them, they can help us to better understand ourselves. A gray wolf explores her enclosure at the Oakland Zoo. The wolves can now be found in the wild in the state. Seven years after an Oregon wolf named OR-7 caused an international sensation by taking a historic pilgrimage through California, his offspring are settling in the Golden State, starting families and giving every indication that the howling canines are here to stay. Wildlife biologists regard the re-establishment of Canis lupus in California as a milestone in the country’s decades-long effort to protect and preserve natural habitats and endangered species. Up to 2 million gray wolves once lived in North America, but European settlers, fed by big, bad wolf myths, drove them to near-extinction in the lower 48 states. The last wild gray wolf in California before OR-7 showed up was killed in 1924. Four of OR-7’s progeny have been detected in California this year and last, including the leader of the Lassen Pack, which has staked out territory in western Lassen and Plumas counties, according to a recent update on the status of the predators by the California Department of Fish and Wildlife. Several others could well be roaming through the state undetected, said wildlife biologists, who expect the wolf population in the Golden State to grow. 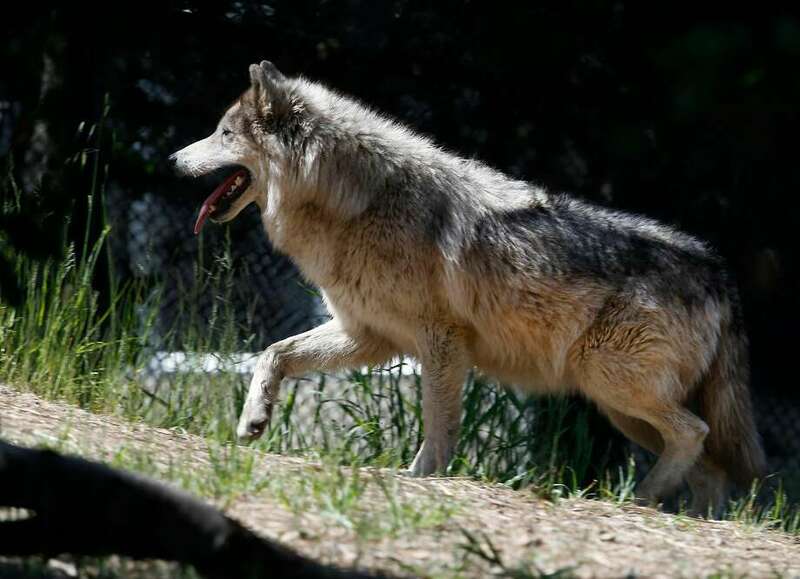 Above: The wolf known as OR-7 became the first known wolf to enter California since 1924 in late 2011. Right: A close-up of a female gray wolf at the Oakland Zoo. OR-7, so named because he was the seventh wolf affixed with a radio collar in Oregon, eventually returned to his home state and found a mate. He is now the alpha male in the Rogue Pack, south of Crater Lake National Park, where he and his mate have raised litters every year since 2014. One of his sons entered California and started the Lassen Pack, which is often seen in the Indian Valley area north of Quincy, in Plumas County. Known as CA-08M, he and his mate have had four puppies, three of which were spotted by locals and on trail cameras in late March. An uncollared wolf Figura said is the likely daughter of OR-7 is also in California, where she was observed and tracked in January moving southeast through Siskiyou County. In January, wildlife biologists tracked another of OR-7’s daughters, OR-54, 500 miles through four California counties. The radio-collared female covered much of the same ground her famous father did from 2011 to 2013. State wildlife biologists said GPS showed she left California in February and then returned to eastern Siskiyou County on April 15. Another collared wolf known as OR-44 was tracked in March nosing around eastern Siskiyou County, apparently looking for females. He is unrelated to OR-7 or his offspring. Although conservationists are ecstatic, there is a disturbing element about the uptick in wolf activity. The first breeding pair of wolves ever in California had five puppies in the spring of 2015, all of them sporting distinctive black coats. The black wolves, known as the Shasta Pack, killed and ate a calf in November 2015, the first reported case of livestock predation by wolves since their return to California. Curiously, that month was also the last time the entire pack was known to be together. None of the seven were seen again until May 2016, when a single juvenile male was spotted by trail cameras near where it grew up. In March 2017, that same wolf was spotted in northwestern Nevada, the first wolf verified in Nevada in nearly 100 years. Nobody knows what happened to the other members of the Shasta Pack. Figura said it is possible they all migrated to a new region, but that would be unusual. Weiss believes the predators, none of which had radio collars, were gunned down. Ranchers in the area had previously threatened to employ the “three S’s” — shoot, shovel and shut up — if any of the sharp-toothed meat-eaters got near their livestock. State wildlife officials are trying hard to minimize wolf-livestock conflicts by providing ranchers with the locations of the animals, but not all of the wolves in California have GPS collars. The Lassen Pack traverses both public and private property, including National Park and U.S. Forest Service acreage and ranch and timber lands. Meanwhile, two more calves in Northern California fell prey to wolves in 2017 and one adult cow is believed to have been killed by the pack hunters. Ever wanted to kill a wolf? If so, now’s your time. In Wyoming, wolf hunting is now legit—365 days a year across 85 percent of the state, where wolves are classified as shoot-on-sight vermin. Guns, snares, explosives, trucks, and snowmobiles—almost any form of violence is allowed to kill these animals. Today anyone in most of Wyoming can kill wolves without a hunting license, putting at great risk a wildlife species whose populations in the Lower 48 remain a dim shadow of what they once were and whose recovery in the Rockies is tenuous at best. And what about the other 15 percent of the state, concentrated around the Jackson Hole area and the Tetons? That’s a “trophy area” where wolves may be seasonally hunted from October 1 to December 31. Unlike much of the rest of Wyoming—where ranches and extractive industries have seriously degraded valuable wolf habitat—the northwest corner still offers wolves, grizzlies, and the other large predators remaining in the West a corner in which to struggle to survive. And now even that refuge is under fire. During the 2017 hunting season (the first legal hunt in Wyoming since 2013), licensed hunters killed 44 wolves in the trophy area—12 alone within the first 40 hours of the open season. Another 32 were killed across the rest of the state last year. And at least 48 are estimated to die annually from human impacts outside of hunting. To put this in perspective, before wolves were removed from Endangered Species Act protection, there were approximately 380 wolves inhabiting Wyoming’s 97,814 square miles. In a single year, Wyoming may have lost a quarter of all its wolves. How did this happen? Let’s take a look back. In 1995, the U.S. Fish and Wildlife Service reintroduced wolves to Yellowstone National Park. The wolves prospered, multiplied, and eventually offered affirmative proof of this animal’s importance to ecosystem health. The successful reintroduction also demonstrated that, almost incredibly, there was still sufficient unimpeded wilderness in the continental United States to allow this far-ranging alpha predator to thrive. The growing number of packs steadily expanded their range as succeeding generations of wolves began to disperse, following the elk herds on their seasonal migration southward out of Yellowstone and into the Tetons. And that’s when the trouble began. In 2003, just eight years after the Yellowstone reintroductions, the USFWS reclassified the endangered gray wolf under the ESA as threatened, thereby downgrading its protective status. The USFWS, fatigued from years of having to manage the intense public opinions that surround this species, was eager to stop having to oversee wolf management and began planning the wholesale removal of the “recovered” Northern Rockies populations from the ESA. The agency planned to devolve wolf management to the states of Wyoming, Idaho, and Montana, which under law would have to devise management plans that would ensure the maintenance of minimum sustainable populations. 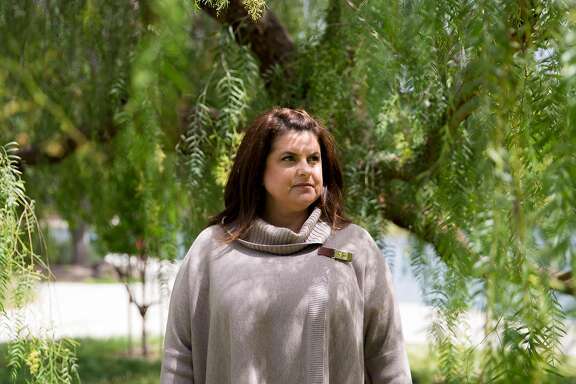 For more than a decade, wildlife advocates fought the attempted delisting in court. The wolves in the Northern Rockies bounced back and forth between being legally protected and at the mercy of state agencies. After a brief period under state management, Wyoming wolves were placed back under the protection of the ESA. A 2009 federal district court decision held that the entire state constituted a “significant portion” of the wolves’ range—a proven historical fact, all the more pertinent given the depleted numbers of wolves throughout North America today. But in March 2017, the D.C. Circuit Court reaffirmed Wyoming’s wolf management plan, ruling that the “2009 decision has been overtaken by events.” According to the court, the USFWS “has adopted a new definition of ‘significant portion of its range,’” allowing wolves outside the trophy zone to be destroyed with no repercussions to the species recovery across the greater Yellowstone ecosystem. Therefore, the court held, “The [USFWS] has offered ample rationale for determining that the predator area was never ‘envisioned to meaningfully contribute to wolf recovery in the region’ and is thus not a ‘significant portion of its range.’” Wyoming’s wolves were overnight reduced from a federally protected species to vermin across 85 percent of the state. Idaho and Montana have adopted a more traditional approach to wolf hunting based upon districts, season licenses, and quotas. While those licensed hunting programs have still proved lethal to wolves—at least 271 wolves were killed in Idaho 2016, and 247 in Montana—they are not as sweeping as the no-holds-barred approach across most of Wyoming. What’s behind Wyoming officials’ antipathy toward wolves? The primary justification for the state’s wolf hunt is, supposedly, economic. Wolves are blamed for livestock depredations in a region that is still emotionally and economically invested in the teetering myth of the independent cowboy, despite the fact that many ranchers graze their herds on public lands and insist that representatives of the USDA’s Wildlife Services agency employ any number of methods—including, per the USDA website, “trapping, snaring, shooting, and the use of chemical products and immobilization and euthanasia drugs”—to remove or kill offending predators. According to the USFWS, wolves killed a record number of livestock in 2016, including 154 cattle, 88 sheep, and one horse; that’s up from a total of 134 depredations in 2015. In response, government “wildlife managers” killed 113 wolves, up from 54 the year before. To put this into context, the 2016 casualties from disease and weather alone among Wyoming’s sheep herds was 37,550 animals. Wyoming residents are permitted to shoot on site any wolf they find that is attacking or “molesting” livestock or a domesticated dog. 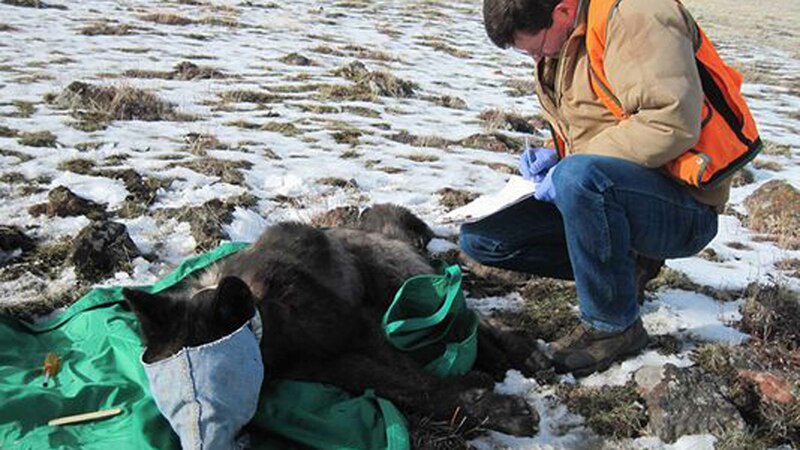 Ranchers are also able to seek compensation for livestock lost to wolves. A brochure published by Wyoming Game and Fish states “Landowners may be compensated for verified damage to livestock caused by wolves. Landowners must submit a signed and notarized damage claim affidavit to the WGFD.” But even though ranchers may get financial relief for any wolf attacks on their livestock, some ranchers insist that the wolves still have to die. This all makes scientific sense—but science isn’t the issue in Wyoming. Rather, it’s the occasional threat to livestock growers’ incomes that fuels the attacks against wolves and other predators. But predators are hardly the main problem; according to the USDA, in 2015 non-predator causes of death (mainly respiratory diseases) accounted for almost 98 percent of adult cattle mortality, and almost 89 percent for calves. Of the numerical sliver of cattle and calves that were killed by predators, wolves took only 4.9 percent, while coyote predation came in at 40.5 percent. Even domestic dogs claimed 11.3 percent, more than twice that of wolves. The annual elk slaughter was conducted primarily to prevent damage to important biotic features such as the cottonwoods and willows that stabilized stream banks; without any fear of predation, elk herds would simply stay put streamside and gnaw new shoots to the roots, eventually resulting in erosion, sedimentation, and the loss of freshwater trout habitat. Large carnivores were reintroduced to the landscape in part for this reason: They keep prey species below their maximum carrying capacity and in the process hold diseases in check and balance ecosystems. With the reintroduction of wolves, and a concomitant increase in grizzly numbers (the bears will sometimes appropriate or scavenge the remains of wolf kills), Yellowstone’s bloated elk population rapidly decreased by around 65 percent. But this turned some hunters against the resurgent wolves. The trophy males that are the chief interest of hunters are (if not infirmed by age) usually the healthiest and strongest members of the herd. Anyone who has encountered a cantankerous 1,500-pound bull moose standing seven feet at the shoulder will understand the reluctance of any predator to challenge it head on. Predators naturally target the easiest, least demanding prey: the young and old, the sick and lame. Therefore the impact of wolves to healthy adult male elk, mule deer, bison, or moose is ecologically minimal. As it currently stands, Wyoming’s wolf management plan requires the maintenance of a 100 x 10 ratio: that is, 100 wolves with at least 10 confirmed breeding pairs in the entire state, not including Yellowstone National Park or the Wind River Shoshone/Northern Arapahoe Reservation. The plan also calls for state biologists to define a “buffer” against this minimum required population, which presumably would mean more wolves than the required minimum. But the buffer, already vague, is not a legal requirement of the state’s management plan. And in any case, the Wyoming plan appears to violate federal guidelines, according to attorneys with the nonprofit advocacy group Earthjustice. Under federal regulations, Wyoming must retain a total of 150 wolves, including 15 breeding pairs, throughout the entire state, including the national parks and the trophy game area. Although the state can take the population down to the bare minimum and still remain within the law, the targets seem arbitrary, says Timothy Preso, managing attorney of Earthjustice’s office in Bozeman, Montana. Preso said the statewide “dual classification” zoning system that is unique to Wyoming, along with the state’s lack of a meaningful buffer to support the minimum required numbers of this isolated population, is at the heart of conservationists’ issues with the Wyoming plan. “We will continue to fight to protect wolves against extreme and hostile state management policies,” he said. A Norwegian court on Tuesday granted a reprieve to seven wolves near Oslo caught in the middle of a battle between environmental activists and sheep farmers. The Oslo district court granted a request from the Norwegian branch of the World Wildlife Fund (WWF) and issued an injunction temporarily stopping the hunt of 12 wolves in the Oslo region—five of which have already been killed—pending a final decision on the matter. The number of wolves in the Scandinavian country is modest—between 105 and 112 individuals, according to the latest count—and the species is listed as being at risk of extinction. But its current population is above the target set by Norway’s parliament. This winter, regional wildlife management authorities gave the go ahead to the culling of 50 wolves. While the final number still depends on a government decision, the announcement caused an uproar among animal rights activists. Tuesday’s court decision concerns only Oslo and its surrounding regions in southeastern Norway. The hunting of 14 other wolves will still be allowed in the rest of the country. One of them has already been killed. WWF Norway has sued the state over its wolf policy, which it argues violates the country’s laws and constitution, as well as the Bern Convention on nature conservation. The Oslo court will rule on that matter at a later, as yet unspecified date. According to WWF, wolves account for just 1.3 percent of deaths in sheep flocks, which also fall victim to accidents and other predators such as wolverines, lynx, eagles and bears. A hunter shot and killed a wolf that he said was running at him. A 38-year-old hunter says he shot and killed a wolf that was “running directly at him” in northeast Oregon’s Union County, the Oregon State Police reported Tuesday. It’s illegal to kill a wolf in Oregon, but police said the hunter, who wasn’t named, won’t be charged because it’s believed he was acting in self-defense, officials said. The incident marks the first time that a wolf has been reported shot in self-defense in Oregon since they began returning to the state in the late 1990s. According to police, the hunter was stalking elk in the Starkey Wildlife Management Unit when he observed three of what he assumed were coyotes, police said. One of the animals began to run directly at him, while another made its way around him, the hunter told police. He said he screamed at the lead animal but, fearing for his life, shot the animal a single time. 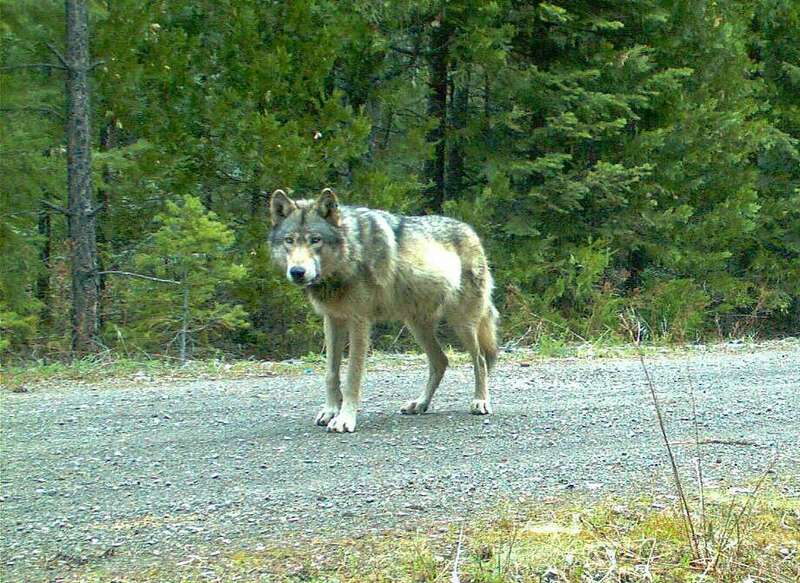 Here’s a picture of the wolf killed last week by a hunter in NE Oregon. He claimed self defense. No charges pending. Later, the hunter, who is from Clackamas County, later discovered the animal was a wolf and “self-reported shooting a wolf in Union County,” police said. Confirmed reports of wolves attacking humans are extremely rare. 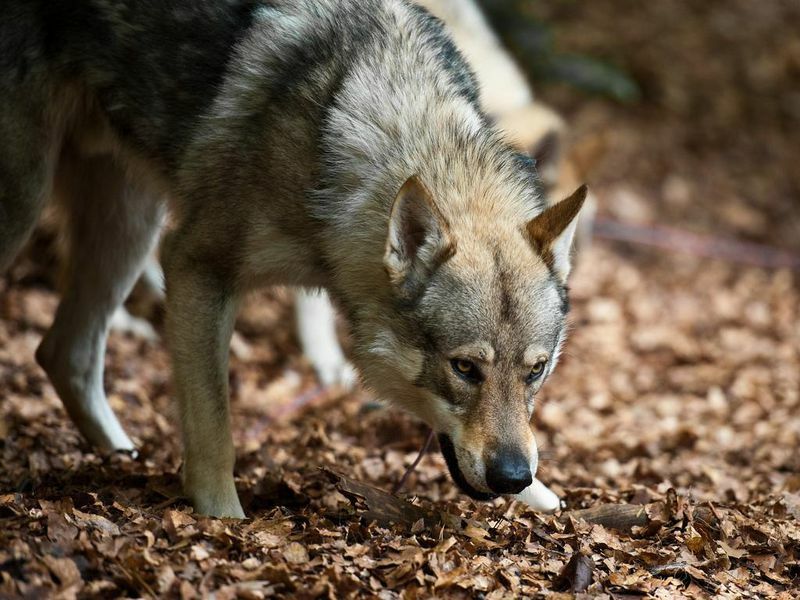 “Wolves typically try to avoid humans whenever possible,” Oregon State University professor Bill Ripple told the Statesman Journal in a previous interview. WASHINGTON — Legislation under committee consideration in the U.S. House of Representatives today would strip gray wolves in the western Great Lakes states of protections they enjoy under the Endangered Species Act. Less than two months after an appeals court in Washington, D.C., ruled that the protection afforded wolves in Michigan, Minnesota and Wisconsin should continue unless there is a further study, the House Federal Lands Subcommittee today took up legislation that would reverse that decision. A second bill —- co-sponsored by several Republican Michigan members of Congress — would do much the same and is expected to get a vote in the subcommittee, as well, perhaps as early as this week. The section regarding gray wolves’ protection considered by the Federal Lands Subcommittee is part of a larger bill that would take steps to ensure that public lands remain largely open to hunting and fishing. During today’s hearing, Democrats voiced deep concerns about other portions of the legislation, including measures that would make it easier for people to buy firearm silencers and put more of a legal and financial burden on law enforcement when stopping a vehicle suspected of potentially transporting a firearm across state lines. The U.S. Fish and Wildlife Service has been attempting for years to de-list the 600 or so gray wolves in Michigan’s Upper Peninsula and larger populations from Minnesota and Wisconsin from protection under the Endangered Species Act but has been turned back each time. 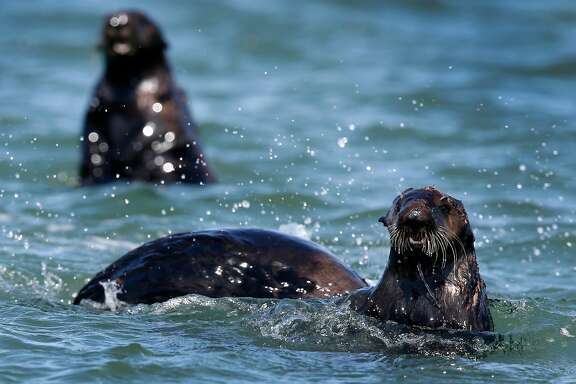 In the most recent ruling, the court said Fish and Wildlife could not go through with such a de-listing without studying what such a move would mean to the population across the rest of the U.S. Proponents of hunting wolves argue that the numbers are significantly recovered to allow for de-listing and that wolves increasingly threaten livestock, reduce deer populations and even threaten humans. In August, Wayne Pacelle, president and CEO of the Humane Society of the United States, called such anecdotal evidence “fabricated” and “exaggerated,” noting that in cases where wolves are found to kill livestock, farmers can get permission to kill wolves. Michigan rejected wolf hunting in state referendums in 2014. The legislation — like that co-sponsored by Republican U.S. Reps. Bill Huizenga of Zeeland, John Moolenaar of Midland and Tim Walberg of Tipton — calls for issuing the order de-listing wolves within 60 days of it being signed into law and prohibits any judicial review of the order. While it’s possible the full committee would send both measures to the full House for consideration, it’s unlikely both would be scheduled for a vote. The more sweeping legislation could be seen as more of a priority then and could get top consideration. But the legislation still faces difficulties: With so much before Congress between now and the end of the year, it could be caught in a logjam and Democratic members of the U.S. House, while outnumbered with Republicans in the majority, will likely try to do all they can to slow it, especially because of the firearm portions of the bill. If it gets to the Senate, it would have to cross a 60-vote threshold. Republicans hold only a 52-seat majority in the Senate, though some Democrats from western and rural states potentially might be convinced to vote for it with changes. 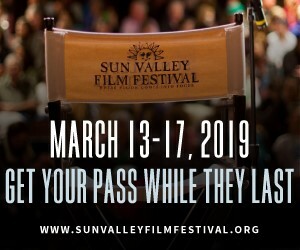 Contact Todd Spangler: 703-854-8947 or tspangler@freepress.com. Follow him on Twitter @tsspangler. Staff writer Keith Matheny contributed to this report.